This week I celebrate the one year anniversary of Serving Grace Ministries Blog. Although this particular article was not my first post, it was the one of the most important in launching my desire for writing. It was originally written for and published through SB Faith and Family Magazine. With a thunderous roar, the heavens rolled back like an ancient scroll. Radiant light filled the night sky as multitude upon multitude of angels, in one accord trumpeted, “Glory to God in the highest, and on earth peace, goodwill toward men!” Goodwill towards men…God’s will towards mankind. In one moment of time, God’s grace was released upon the earth in a manner not seen since the time of Adam and Eve prior to the fall. What had previously appeared to be a trickle of grace was now undeniably a flood. This outpouring of Grace was not just available to a few select, but was now available to all mankind. “For the grace of God that brings salvation has appeared to all men, teaching us that, denying ungodliness and worldly lusts, we should live soberly, righteously, and godly in the present age” (Titus 2:11-12). Jesus is the grace who brought salvation to the world. 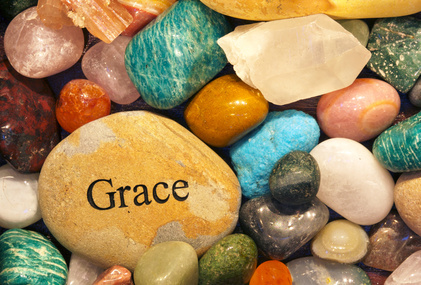 Grace is for the here and now, not just for the sweet by-and-by. Grace did not come to this earth to give us freedom from all responsibility, but to show us, by example, how to live a life totally pleasing to the Father. Grace empowers us to live a life in which each member of the body of Christ is to do his or her individual part for the Kingdom of God. Grace is the action to God’s love. “For God so love the world that He gave…”Grace will never expect something from you that He is not willing to do Himself. Grace loves, Grace gives, and Grace serves. Grace expects the same in the form of good works from those who call upon Him as Lord and Savior. “For we are His workmanship, created in Christ Jesus for good works, which God prepared beforehand that we should walk in them.” (Ephesians 2:10 NKJV). Grace will lift you up when you are down, strengthen you when you are weak and love you when you feel unworthy of being loved. Grace will call you a son, a daughter, a brother and a sister. Grace promises that He will never leave you nor forsake you. Grace will never put sickness on you to teach you; for Grace bore the stripes on His back to deliver you from sickness (Isaiah 53:5). Grace is not the author of death, but is the giver of life. Grace is often shunned by the religious, perverted by the wicked, and frustrated by the legalists. Grace loves when He is not loved in return and reaches out to the hands that are pulling back. Grace loves the loveless, dines with the sinner, and dries the tears of the prostitute. Grace sheds a tear over the lost, but rejoices over the found. Grace exalts the humble, but frowns upon pride leading to self-exaltation. Grace does not condemn, but does convict. Grace rightly claims that He is the way, the truth, and the life. Apart from Him, one cannot enter the Kingdom of Heaven. Grace never promises a life free from obstacles, but does promise that, by following Him, all obstacles will be overcome. Grace is love and Grace loves you! Be blessed in the Lord and in the abundance of His grace and mercy. Congratulations 🙂 I pray Grace will continue to keep you close to Himself and continue to inspire you to share what He teaches you with others. Thank you very much…If our words impact only one person, it is still worth it. Patrick, hello! Read a comment of yours on Jules blog. Pure Grace and favor to read across to you:) I am looking forward to reading more of your blog. blessings on your anniversary of writing and sharing about God’s Grace.. His Son, Jesus Christ! Thank you Denise. I wandered over to your site and was happy that I did. Your love for Jesus is evident all through your posts. Without God’s grace, I’m sure my life would have ended many years ago. I owe Him everything.